It was late afternoon and the light was beginning to fade as I made my way westbound on the cut-off trail along the north side of the Scuppernong River. 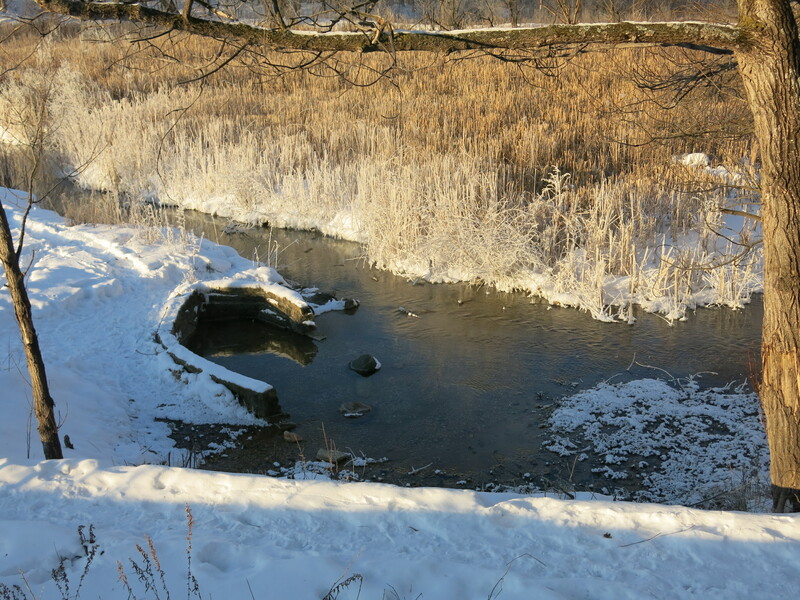 My footsteps crunching the snow alerted the dabbling ducks near the bend in the river in front of the old barn site of my arrival, which they discussed with noisy quacking. “It’s OK, don’t go, I won’t bother you…”, I said to myself as I attempted to quietly exit the area, while simultaneously stealing glances over my shoulder at the beautiful mallards floating and foraging in the swift current. Too late. Their survival senses, keenly tuned to the habits of the hunter, drove them instinctively to flight. Wings flapped and water splashed as a score of noisily quacking waterfowl flew downstream over the gaging station bridge. Oh well. I continued on the cut-off trail, which lay buried and indistinct under a foot of snow, and suddenly another flock took flight. Wow, that was at least 25 birds! By the time I made it all the way to the marl pit factory, I had roused at least 200 birds from the peace and prosperity of the living waters. 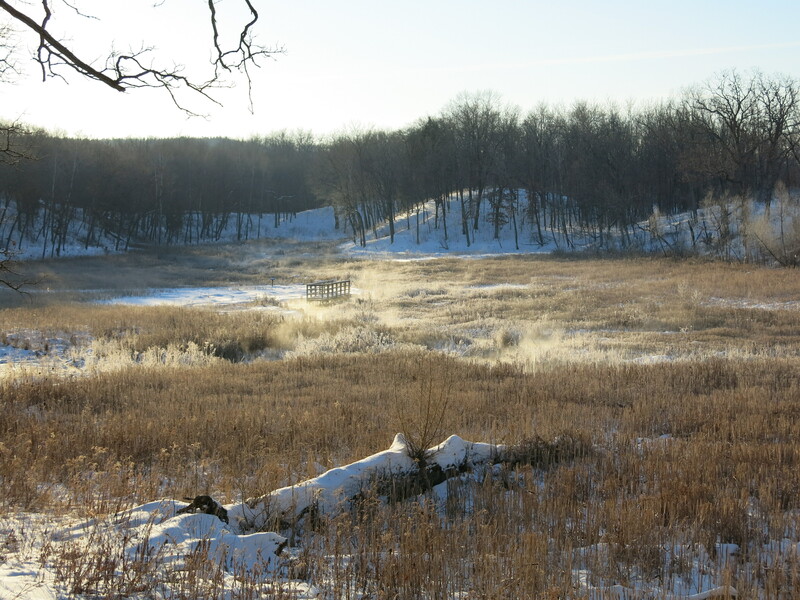 The springs that flow in this “sweet scented land” invoke a feeling of mystery and awe in me. I drink the waters in body and spirit and thank the Creator for these blessed springs, as people have since time immemorial. 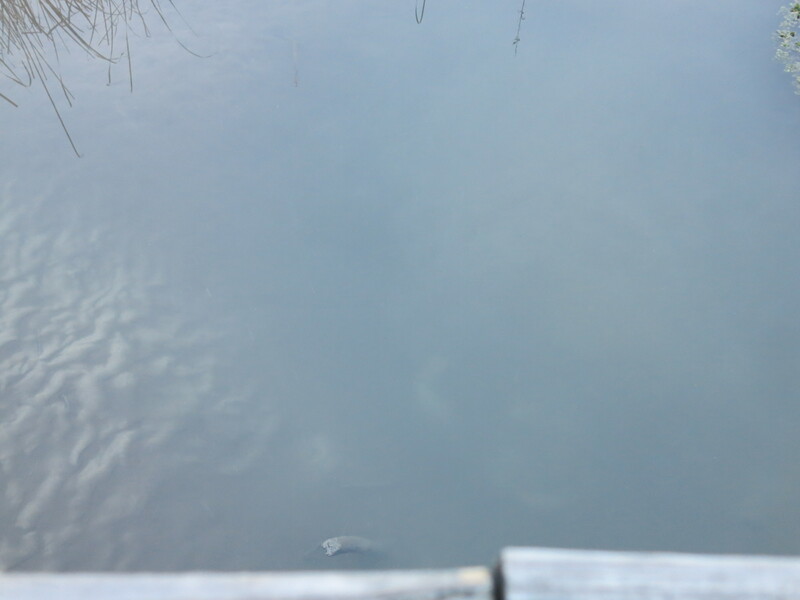 Thursday morning dawned clear and cold and I fetched some living water at the Hotel Spring. 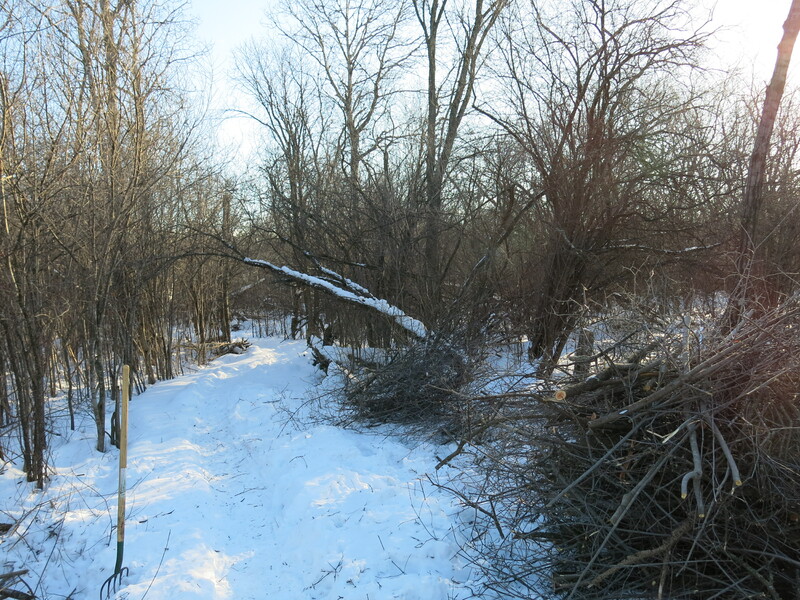 I made my way down the Buckthorn Alley to resume cutting the nearly impenetrable thicket that borders the trail. My eyes were sharper than my blade and I imagined laying down a huge swath on both sides of the trail. It was tough going as I slashed with steel and Stihl on the south side of the trail. 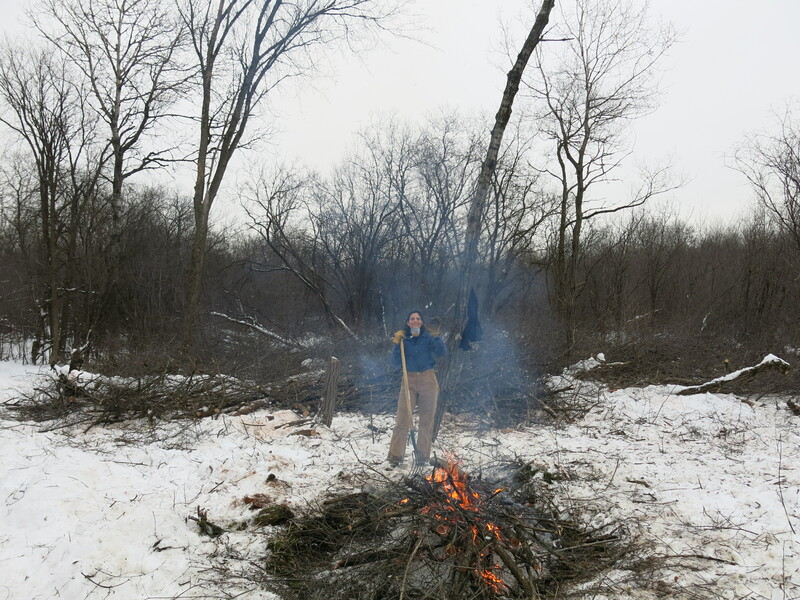 Pati joined me and stoked the fire with freshly cut buckthorn. We both simply enjoy being outside; our work is play. 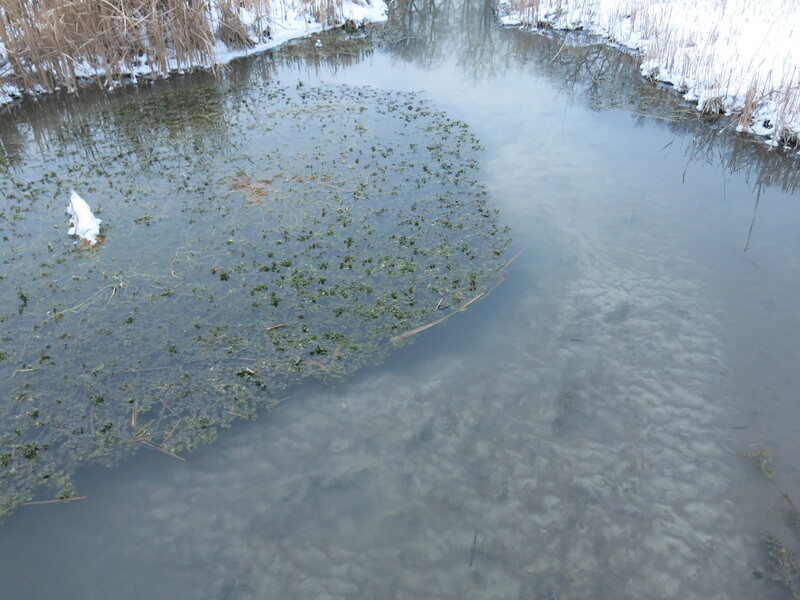 When I finally arrived at the gaging station bridge, after spooking a multitude of mallards, I noticed the river was cloudy with disturbed marl, vegetation and, probably duck poop. I wondered if the activity of the dabbling ducks might actually help reveal the stoney river bottom and thus improve the habitat for brook trout. 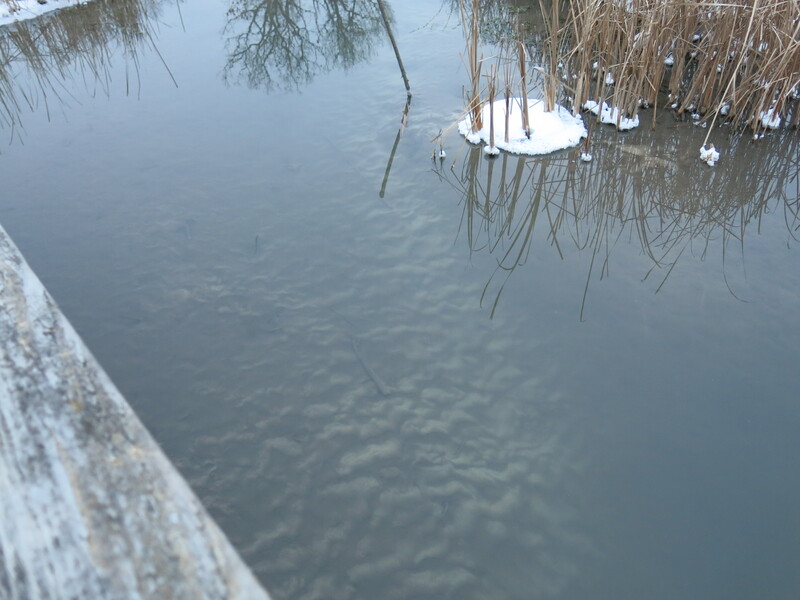 I scared up more flocks of ducks in the vicinity of the Emerald Spring and was surprised that the bubblers there were completely hidden by the cloudy waters. I wondered if the recent deep freeze had driven the birds to the temperate, living waters, of The Springs, and I speculated that hundreds of hunkered down mallards might indeed be responsible for the milky color of the water and the heavy dusting, of what I suspected was duck poop, that had collected on the sandy marl dunes that cover the river bottom in this area. This entry was posted in Brush, Buckthorn, Buckthorn Alley, Scuppernong River and tagged Buckthorn, Kettle Moraine State Forest, Kettle Moraine Trails, Mallard Ducks, Nature, Scuppernong River, Scuppernong Springs, SouthEastern Wisconsin Hiking Trails by paulmozina. Bookmark the permalink.